Paying for parking in advance is only attractive at a certain price. Transit stations, such as many of the outlying stations along the BART system in the San Francisco Bay Area, provide parking so riders can easily get to and from the station. 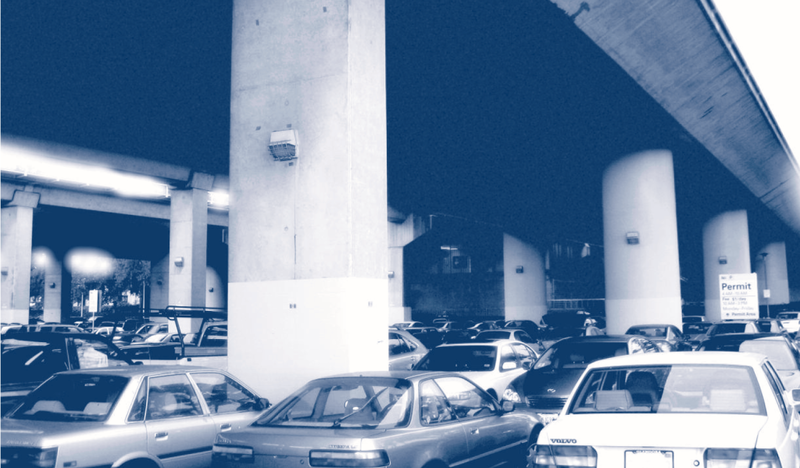 At first parking spots at BART stations were free to whoever showed up earliest to park. Then in 2002, BART began offering monthly reservations on some parking spots for a fee, so that riders who couldn’t rush out of the house to arrive at the station before anyone else also had the opportunity to park. Commuters without the monthly permits are faced with a dilemma if they want to take BART and can’t get to the station early. Do they risk deviating from their driving commute route to try to find a spot at the station? If they don’t find one, they will have wasted time and gas, and they’d then have to find their way back to their driving route, now a bit later, and reinsert themselves into the stream of traffic. 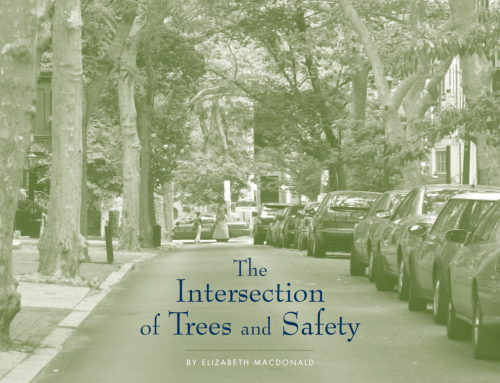 Is there a way for commuters to know whether there are parking spots available? Is there a way for people to guarantee that they can park at the transit station if they exit their driving route? And in the process, is it possible to encourage some drive-alone commuters to park their cars and ride BART? We think so, using what are called “smart parking” systems—broadly defined as the integration of technologies to streamline the parking process. Parking operators have begun using advanced technologies such as changeable message signs and pay-by-phone schemes in many countries including Norway, Spain, Canada, Ireland, Australia, and the US. We wanted to try it at a BART station in the San Francisco Bay Area. From December 2004 to April 2006, we tested a smart parking system at the Rockridge BART station in Oakland, California, where parking demand is high. There is a substantial waiting list for monthly permits—but even with a ten percent over-subscription rate not all the spots are filled every day because not all the monthly permit holders commute by BART each morning. BART makes these spots available to anyone after 10 a.m. We wanted to see if smart parking technologies could complement the monthly reserved program by providing daily flexibility during the morning commute for those not using transit every day. We also wanted to test the various components of the service, and to see if we could attract new riders off the freeways and on to BART. The research project was a public-private partnership among California Partners for Advanced Transit and Highways (PATH), the California Department of Transportation (Caltrans), the BART District, ParkingCarma, Inc., a company that builds technology for smart parking applications, and Quixote Corporation, an advanced transportation technology company. Also, Intel donated hardware and Microsoft donated software for the experiment. 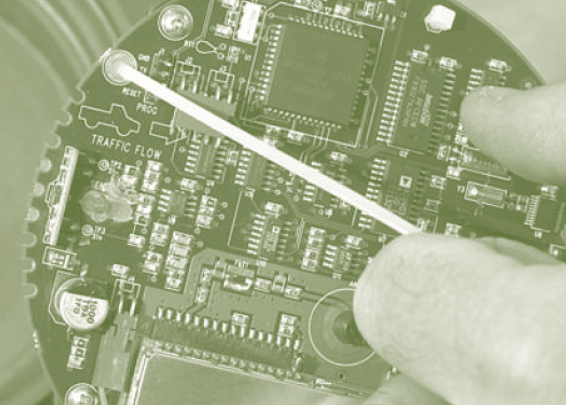 The project coordinated three key technologies that had not previously been combined in any smart parking system. First, six in-ground electromagnetic sensors counted the number of cars entering and exiting the parking lot. Second, a computer reservation system used both an online, real-time user interface and a telephone Interactive Voice Response service. 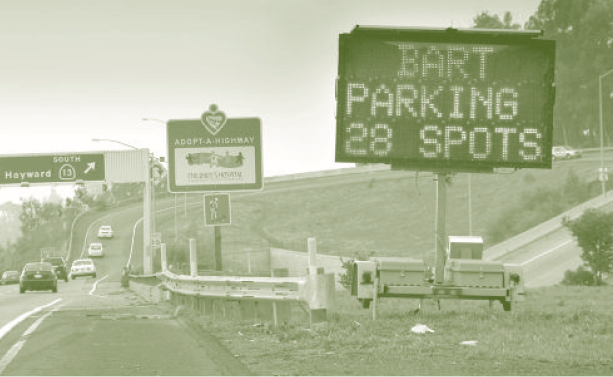 Third, two solar-powered changeable message signs on the freeway near the exit for the Rockridge BART station announced the number of available spaces and which exit to take to access the parking lot. Researchers conducted two focus groups, two web-based user surveys (at the beginning and at the end of the project), and interviews with ParkingCarma managers and the smart parking project manager, a PATH employee. We also collected and analyzed reservation data from ParkingCarma. The smart parking experiment used fifty of the 274 spaces in BART’s east lot, increasing the number of peak period spaces available by using some spaces set aside for use after 10 a.m. Participants could make either advanced reservations—from two weeks to same day (if available)—or drive-in reservations. They could make the reservations either by phone or online, but could only use advanced reservations three times every two weeks; this restriction was placed on the experiment by the research team to encourage more users. Informational signs on local freeways approaching the station displayed the number of spaces available in real time (but always five less than the actual number available, to maintain a buffer). The service operated during the peak hours of 7:30 to 10 a.m., Monday through Friday, and BART security personnel monitored the parking lot, checking license plate numbers to enforce compliance. During the experiment, there were over 13,000 successful drive-in and advanced reservations made. 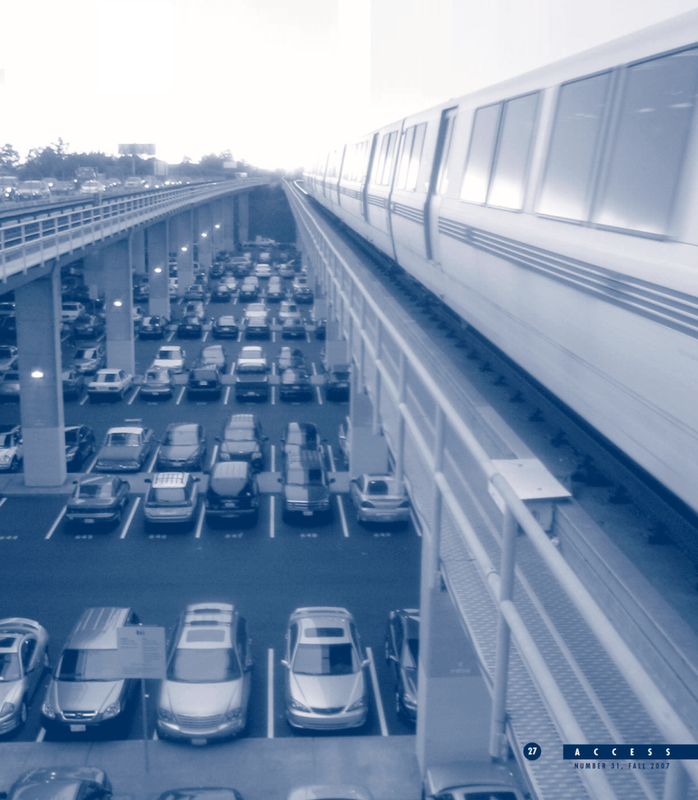 Final survey results suggest that smart parking increased transit use among respondents: nearly half the respondents said that they would not have used BART to commute if smart parking were not available. Smart parking participants also used BART more frequently, averaging an additional 5.5 trips per month for commuting to work and an extra four trips per month for off-site trips. Also, the program reduced overall vehicle miles traveled by 9.7 fewer miles per participant per month on average, and their commute time was shortened by an average of 2.6 minutes. We placed changeable message signs on a heavily trafficked roadway that often becomes congested during peak periods. The signs operated during morning commute hours, from 7:30 to 9:40 a.m., Monday through Friday. However, the final user survey revealed that less than half the participants in the surveys and focus groups saw or used the signs to help them decide whether to use the smart parking service. 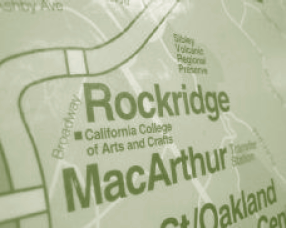 The signs, they said, were not located on their commute route, so it may be that additional signs are needed on roads approaching the station. Their answers highlighted the importance of placement and number of signs. There was also a fair amount of mistrust about the accuracy of the signs. Participants feared the empty parking spots would be filled before they arrived at the station, even though they could call to reserve a spot as soon as they saw a sign. We had not told them about the five-space buffer, of course, and perhaps the mistrust was due to their inexperience with the new technology. We will expand our research on sign messaging and user understanding in our next study of smart parking in San Diego, based on these results. ParkingCarma’s customized interactive voice response telephone system handled approximately 9,000 reservations throughout the experiment. Participants generally liked the spontaneous flexibility that drive-in reservations enabled, but they also offered suggestions to improve the system. Problems arose around its ability to understand verbal commands in a noisy environment, for example, and users wanted instructions to be repeated. They also distrusted the accuracy of the real-time available-space count as given by the phone system. This is another area for further investigation in our next study. Our respondents noted fewer problems with the web-based reservation system. Participants generally liked the parking history feature, which displayed the dates of all past reservations. Several respondents thought it was difficult to create an online account, but the web site “wizard,” intended to help first-time participants, was underused, according to ParkingCarma staff. Overall, the majority of final survey respondents (75 percent) never encountered a situation where they arrived at the lot with a reservation but there was no spot for them. Further investigation into what happens in such a case will be included in our next study. 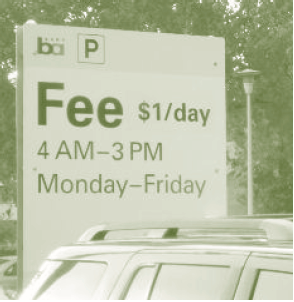 Smart parking fees were implemented in October 2005 (ten months into the experiment at the Rockridge station), to investigate the effects of pricing on user behavior. BART managers set the price of advanced reservations at $4.50 per day and drive-in reservations at $1 per day. The majority of respondents did not stop using smart parking when fees were implemented, although reservation data indicate that advanced reservations decreased and drive-in reservations increased (as seen in Figure 1). The percentage of advanced reservations decreased by a monthly average of thirteen percent after the parking fees were implemented. We asked survey respondents what was the maximum price they would pay for smart parking. 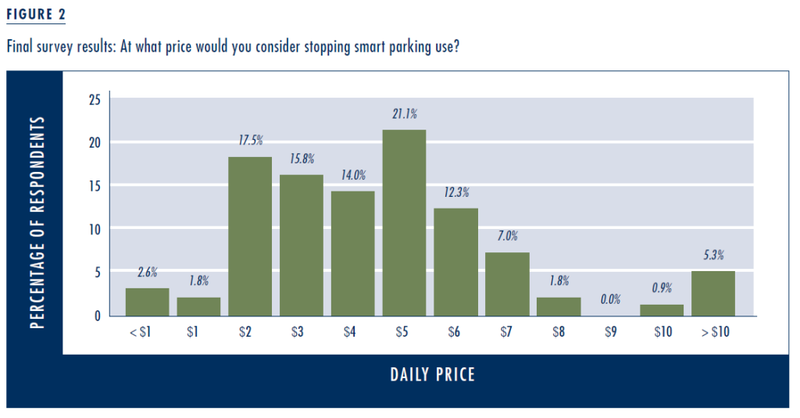 Figure 2 illustrates that nearly three quarters of them would stop using smart parking if daily parking fees got as high as $5 per day. 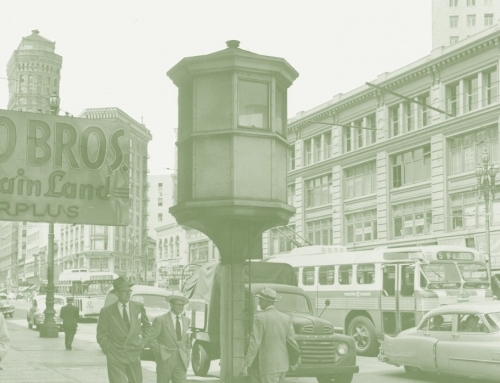 Many also expressed concern that the costs of parking and BART fares combined were too much, and the cost of advanced reservations, in particular, was too expensive. Many of our smart parking users expressed disappointment when the experiment ended and encouraged its continuation and expansion to other stations. 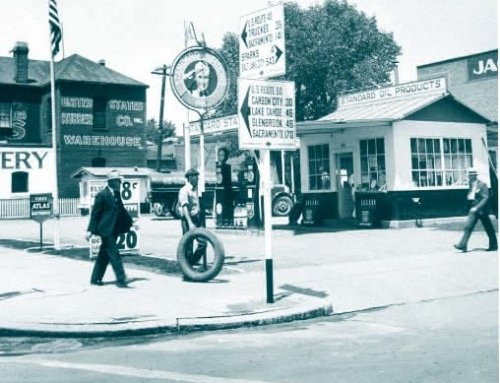 When they used advanced reservations they could rely on having a parking space at the station and sometimes they were able to avoid early morning traffic jams by using drive-in reservations. Many focus group participants said their quality of life rose due to the smart parking service; this was related to reduced stress and the ability to sleep a little more. 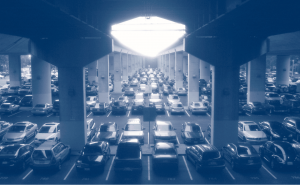 An important consideration for future smart parking projects is that the majority of users did not discontinue their use of the service after pricing fees were implemented. While advanced reservations did decrease at this time, drive-in reservations increased, and it’s likely these changes were due to the price difference rather than to the existence of fees. 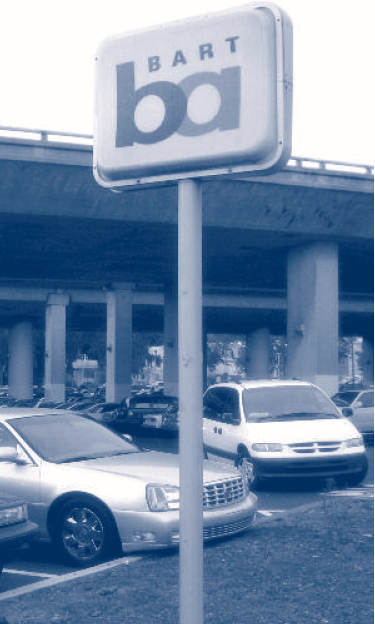 The main concern about fees was that the cost of parking and BART fares together was too high. Meanwhile, BART has now implemented fees on all parking spaces at the Rockridge station. Unreserved first-come, first-served spaces cost $1 a day; BART also put into place a system whereby riders can purchase a one-day reservation online and print out a permit ahead of time. This is similar to the system we introduced in our experiment, but without the advanced technology and the ability to pay by phone on the spur of the moment. We will soon apply the lessons we learned from the Rockridge BART smart parking project along the San Diego Coast Express Rail route. This three-year pilot project, funded by Caltrans, PATH, and the Federal Highway Administration, will include a value pricing component, providing the option to pay an additional fee to make advanced reservations for premium parking spots. We will experiment with more detailed messages on changeable message signs, such as traffic conditions and incident reports; using smart cards or transponders to enhance parking payment options; charging different fees depending on factors such as time of day; and expanding the number of parking spaces at and around the transit stations. Through the smart parking experiment, we learned that advanced technologies can be used to streamline the parking process by providing space information and convenient reservation services, and that such a system can complement the monthly reserved program offered at BART stations. 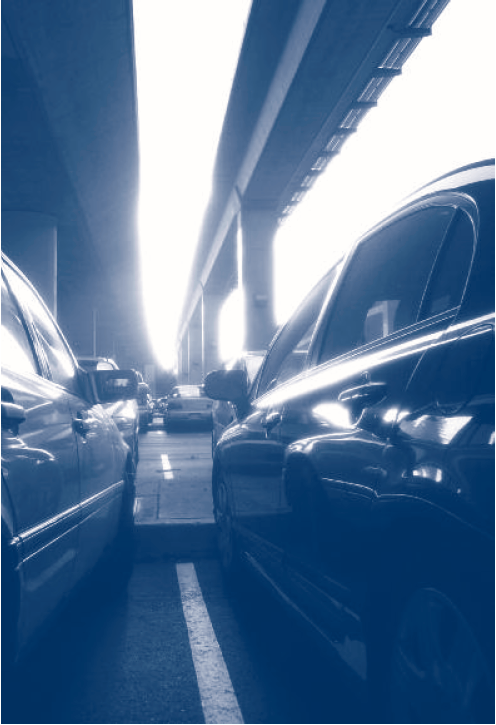 Furthermore, as the increase in average BART trips among users (5.5 trips per month for commutes to work and four trips per month for off-site trips) indicates, it is possible to increase transit use among commuters by implementing a smart parking service. Results from the forthcoming project in San Diego will further add to the growing body of work on smart parking technologies and applications. Susan Shaheen and Caroline Rodier. 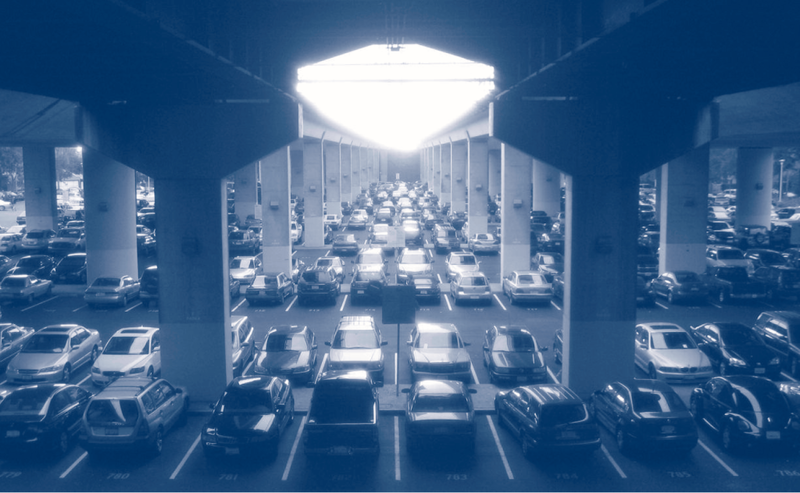 “Smart Parking Management Linked to Transit,” in Research Pays Off, TR News, no. 251, 2007. Donald Shoup. The High Cost of Free Parking (Chicago, Illinois: American Planning Association Planners Press, 2005). Susan Shaheen, Caroline Rodier, and Amanda Eaken. Smart Parking Management Field Test: A Bay Area Rapid Transit (BART) District Parking Demonstration—Phase One Final Report (Berkeley, California: Institute of Transportation Studies, 2005). 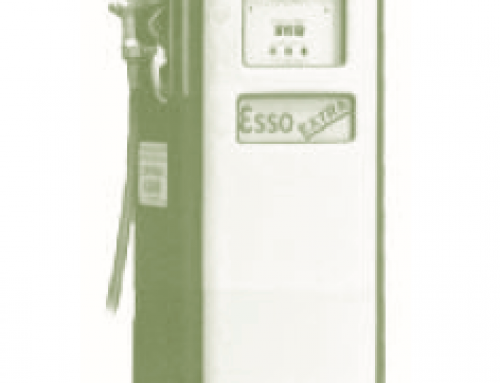 UCB-ITS-PRR-2005-05. 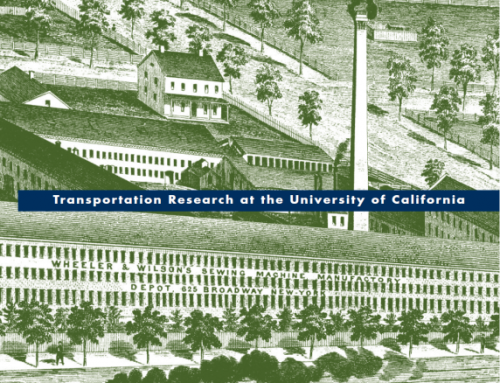 Caroline Rodier and Susan Shaheen, “Transit-Based Smart Parking in the San Francisco Bay Area, California: Assessment of User Demand and Behavioral Effects,” Transportation Research Record, no. 1927, 2005. Charlene Kemmerer is a researcher at TSRC (ckemmerer@tsrc.berkeley.edu).